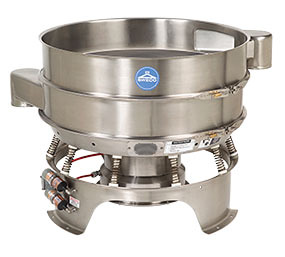 The latest in round separation design from SWECO is the new generation MX Separator. Currently available in 30-, 40-, 48- and 60-inch diameters, the separator is designed to increase safety, provide stronger construction and allow for a more sanitary process. The totally enclosed weight guard on the MX prevents "reach in" injuries, complying with European CE Standards. The extremely rugged construction of this machine utilizes conical construction rather than flat plates which creates a more rigid geometric structure. Additionally, the open base construction allows for cleaning underneath the unit, therefore preventing dirt and product build-up. Separate solids from liquids or segregate dry materials into various sizes. Particles as fine as 400 mesh (37 microns) can be screened, with up to 4 screen decks incorporated in one SWECO separator. No special flooring or foundation is needed and less working floorspace is required. Simple and efficient design requires less horsepower. Other features include long screen life and ease with which screens may be changed. The SWECO Super MX Separator is a heavy-duty option for those processors who require an aggressive separation for their application. Currently available in 48- and 60-inch diameter machines, this high-speed vibratory separator system provides its users with forces as high as 10 Gs and speeds up to 2200 RPM. Made with the same exacting standards and commitment to quality as every SWECO Separator, the Super MX is available for use with all SWECO accessories such as Self-Cleaning Devices, QuickChange Systems, Avalanche Frames, and more.